Kim Jong Un attends the Korean People's Army Tank Crews' Competition in Pyongyang, North Korea, April 1, 2017. 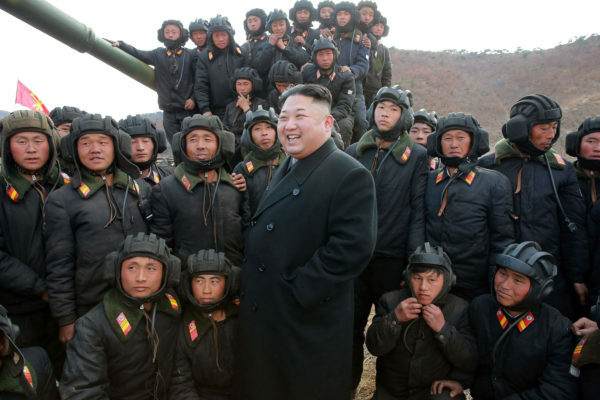 SEOUL — North Korea said on Saturday it had conducted another successful test of an intercontinental ballistic missile, or ICBM, that proved its ability to strike America’s mainland, drawing a sharp warning from President Donald Trump and a rebuke from China. “The test-fire reconfirmed the reliability of the ICBM system, demonstrated the capability of making a surprise launch of the ICBM in any region and place any time, and clearly proved that the whole U.S. mainland is in the firing range of the DPRK missiles, [Kim] said with pride,” KCNA said. DPRK is short for the North’s official name, the Democratic People’s Republic of Korea. The launch comes less than a month after the North conducted its first ICBM test in defiance of years of efforts led by the United States, South Korea and Japan to rein in Pyongyang’s nuclear weapons ambitions. The North conducted its fourth and fifth nuclear tests last year, and it has engaged in an unprecedented pace of missile development that experts said significantly advanced its ability to launch longer-range ballistic missiles. Britain’s foreign minister, Boris Johnson, condemned the launch in a statement on Saturday. “We urge the DPRK regime to put the well-being of its own people ahead of the illegal pursuit of nuclear and ballistic missile programs,” Johnson said. Early on Saturday, the United States and South Korea conducted a live-fire ballistic missile exercise in a display of firepower in response to the missile launch, the U.S. and South Korean militaries said. The Trump administration has said that all options are on the table to deal with North Korea. But it has also made clear that diplomacy and sanctions are its preferred course. The foreign ministers of South Korea, Japan and the United States held separate phone calls and agreed to step up strategic deterrence against the North and push for a stronger U.N. Security Council sanctions resolution, the South and Japan said. South Korea has also said it will proceed with the deployment of four additional units of the U.S. THAAD anti-missile defense system that President Moon Jae-in has earlier delayed for an environmental assessment. China’s Foreign Ministry expressed serious concern about the announced move on THAAD, saying it will only make things more complex. Beijing opposes the missile defense system because its power radars can look deep into China. “We strongly urge South Korea and the United States to face squarely China’s concerns about its interests, stop the relevant deployment process and withdraw the related equipment,” the foreign ministry said in a statement. The missile test came a day after the U.S. Senate approved a package of sanctions on North Korea, Russia and Iran. Trump is ready to sign the bill, the White House said on Friday. The sanctions are likely to include measures aimed at Chinese financial institutions that do business with North Korea. Washington also has proposed a new round of U.N. sanctions on North Korea following its July 4 ICBM test. In Friday’s test, North Korea’s Hwasong-14 missile, named after the Korean word for Mars, reached an altitude of 2,314.6 miles and flew 620 miles for 47 minutes and 12 seconds before landing in the waters off the Korean peninsula’s east coast, KCNA said. Western experts said the flight was an improvement on North Korea’s first test of an ICBM. The flight demonstrated successful stage separation, reliability of the vehicle’s control and guidance to allow the warhead to make an atmospheric re-entry under conditions harsher than under a normal long-range trajectory, KCNA said. The trajectory was in line with the estimates given by the South Korean, U.S. and Japanese militaries, which said the missile was believed to be an ICBM-class rocket. Independent weapons experts said the launch demonstrated many parts of the U.S. were within range if the missile had been launched at a flattened trajectory. The U.S.-based Union of Concerned Scientists said its calculations showed the missile could have been capable of going as far into the United States as Denver and Chicago. David Wright of the Union of Concerned Scientists wrote in a blog post that if it had flown on a standard trajectory, the missile would have had a range of 6,500 miles.